Do you think they have a gym at Dragonstone? 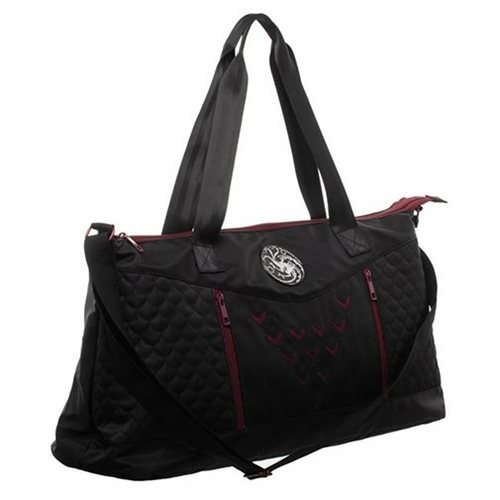 If so, you can use this handy Game of Thrones Targaryen Athletic Duffle Bag to carry your gear to your next workout there. Made of polyester and measuring approximately 24-inches wide x 11 1/2-inches tall x 8-inches long, it features a top main zipper compartment, two front zipper compartments, interior slip pockets and zipper pocket, an adjustable and removeable shoulder strap, and the House Targaryen three-headed fire-breathing dragon emblem!